Missing man George Clingain (38). A man who has not been seen by his family for nearly a month and has failed to return home is giving cause for concern. Police Scotland is appealing for information to assist in tracing missing person, George Andrew Clingain. Mr Clingain, aged 38, is described as white, 5ft 7” in height, of heavy build with receding dark hair and a beard. He has a full sleeve of tattoos on his right arm and on his right leg. He has a circular tattoo on his left arm and a tattoo of a fish on his left leg. He was last seen in Scotland by a family member on July 17 at a residential house in the Thornliebank area of Glasgow. Officers believe that he then travelled to the Donegal area in the Republic of Ireland where he stayed at a B&B accommodation and visited family members and locations in the Republic of Ireland. He was due to return by ferry to Cairnryan, Scotland on August 5 or 6. 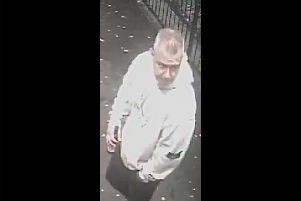 Police officers are concerned for the welfare of Mr Clingain and would ask any members of the public with information to contact Police Scotland as soon as possible. Members of the Public are advised not to engage with Mr Clingain but to report all sightings to the police. Police Scotland can be contacted on the non-emergency number 101 or alternatively Crimestoppers can be contacted in confidence on 0800 555 111.